Oh my homemade ginger syrup!! !I’ve being very true to my word by following up the previous recipe with this easy ginger syrup tutorial. Honestly folks this is sooooo super duper easy and I realise that many of you love recipes that don’t require a challenge, something that’s within your own grasp, simple, easy and most importantly HEALTHY. Now we all should know by now that too much sugar is a bad thing – whether it’s fructose or sucrose. However, I do understand that sweetness constitutes our sense of taste and without it food would taste pretty bland, right? I get that so how do we settle that craving for something sweet or something sour? That’s where this ginger syrup comes to the rescue. 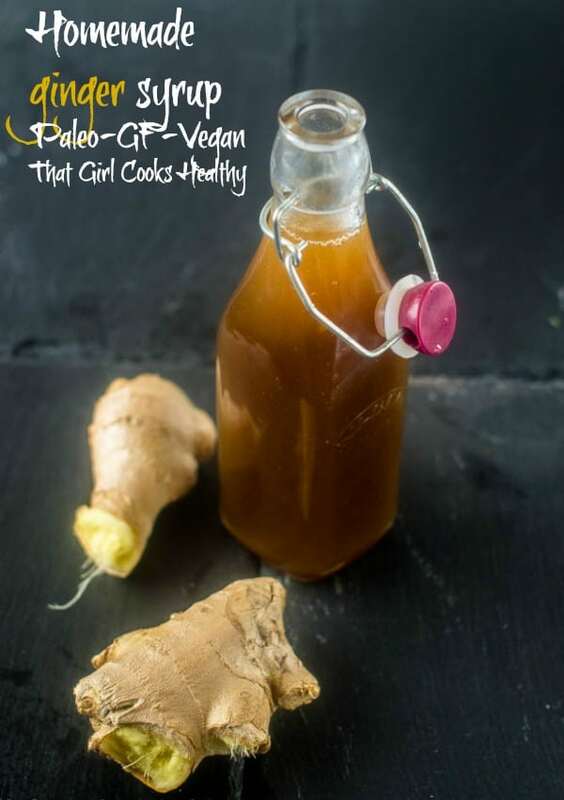 I carefully put together ingredients that were anti inflammatory and suitable for anyone with a craving for sweetness with hypertension or type 2 diabetes, as the ginger and coconut palm sugar release into the blood stream slowly, omitted a crash and burn effect. What is ginger syrup good for? Also, if you suffer from an auto immune disease, you’ll be please to know this won’t cause an adverse reaction to the immune system, where it begins to misidentify good cells as foreign invaders. When I initially made this it cook up to an hour for the ginger syrup to actually form. I know many people don’t have the patience for this some I revised the recipe by adding a 1tbsp of tapioca starch. The starch serves as a fast track step to making the sugary mixture turn into syrup in under 3o minutes. This is the original method which takes up an hour, so have a little patience and a steady arm to stir the contents in the pot. It should be around the 40 minute mark into the cooking when the sugar and ginger water thicken up nicely. Oh on a side note, to begin with I lessen some of the prep time by blending the water and ginger together rather than straining off little pieces from the syrup. 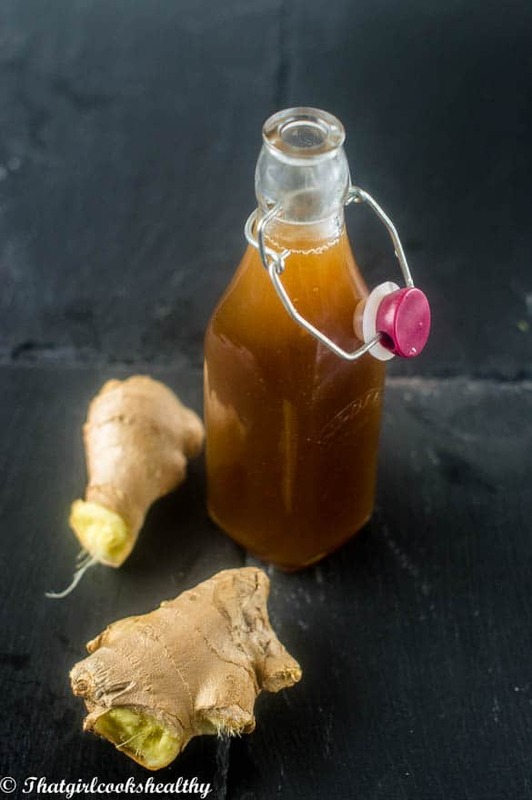 How long does homemade ginger syrup last? Generally speaking it would last for up to 3 months but make sure you store your syrup in the refrigrator where it is cool to lessen the chances of any bacterial growth. I would also advise labelling the syrup with a date to keep track on when it was made. 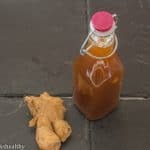 What can I make with ginger syrup? Add the water, tapioca starch and the ginger to a blender and blitz until the ginger has almost liquidized into the water. Pour the ginger water into a medium sized saucepan and bring to the boil and then carefully mix in the palm sugar, a small amount at a time while stirring until all of the sugar is in the pan. Reduce the flame and allow the pan to simmer for 15 minutes, stirring frequently. The mixture may seems thin to begin with, but you will notice the syrup thickening after several minutes. Allow the syrup to cool and pour into a mason jar and store in the refrigerator. Should keep for several days in the refrigerator. 2, Once you have peeled the ginger and pulsed it in a blender with the water, tapioca (if using) slowly add you coconut sugar to the saucepan with the ginger water. 3, This is what the syrup looks like after around 15-20 minutes. It should be dark with thickness to it. 4, Once the syrup is cooled down, pour into a jug then transfer it into jar of your choice. Charlene, I love the fact that you make make get out of my comfort zone and try new things. This one , I have to make , going on my to make list. I am thinking of all the foods I can pair this with. Thanks for sharing!! I don’t make this one too often due to the high content of sugar but it’s great for a sweet treat. Try it on pancakes, desserts, ice creams – you name it! Thanks so much for this! Commercial ginger ales are too sweet for me. I actually cut the palm sugar by a third, and got a nice spicey syrup. Made some baked apples with cardamon and the syrup last night, I will likely use this whole batch by adding it to club soda, but it is easy to make. Hey Meg, thank you so much for commenting. You definitely want to keep some ginger syrup on hand, the things you can do with it is endless. I hope it pairs well with the club soda. I just pulled this recipe up again to make a batch. It’s terrific with the club soda/seltzer. YAY! That’s what I like to hear. I’d like to try this for sure but I’m wondering if you have kept it in the fridge for longer than just a couple of days? I’m thinking it should last for a good long while as long as its refrigerated as there doesn’t seem to be anything in it to go off? Looks great and keen to try thanks! Hi Donna, thank you for commenting. Yes it should last a few weeks. I don’t know exactly how long because I usually make just enough for several days hence my recommendation as I haven’t stored any syrup for longer than the given time. However, despite being free from additives and preservatives, there’s no reason why it shouldn’t last for a number of weeks in your refrigerator. Definitely give this one a try with some pancakes or waffles!